Wow, what a new years eve. Fireworks which sounded like a civil war had broken out, loud explosions rocking the night at regular intervals. Thousands of people with bottles of champagne, though come the magical witching hour it appeared to me not a lot was consumed, rather it was sprayed into the air, and onto whoever was in range, resulting in the feel it had been raining even though the sky was clear. Then came the very surprised, but apparently quite usual ritual of smashing the now empty bottles onto the nearest street. 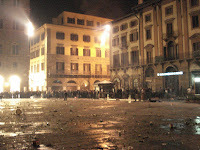 Large piles of broken glass piled up in the main square, just a few meters from the replica David. In the morning, nothing. Just the usual early morning tourists starting to form lines into the usual tourist sights. The street cleaners must all be ready for when the last early morning reveler finally gives up for the night, and then work fast and hard clearing the mess of glass and fireworks. Impressive.